We provide in-house design-build and full-service consulting services from the planning phase to project construction and startup. Whether you’re obtaining agency approval, dewatering, or placing concrete, we can contribute our years of experience to your dam and hydropower projects. Our design and construction staff have hands-on experience building the projects they design, bringing a unique understanding to our process and resulting in lower costs and streamlined construction. 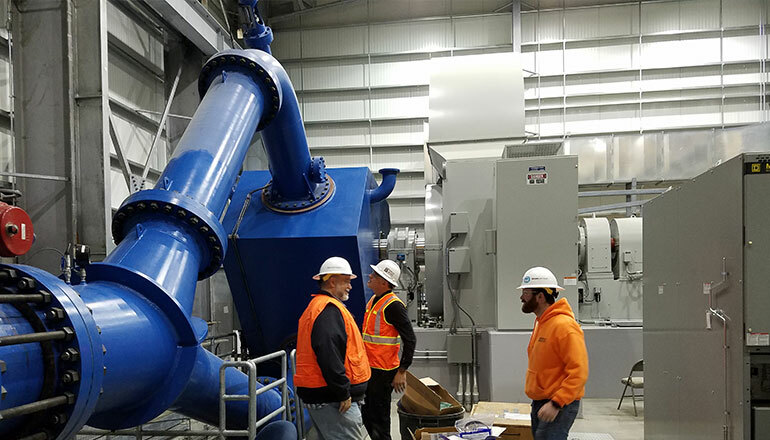 Our significant hydropower experience includes in-water and near-water work, difficult access design and construction, design and installation of complex dewatering systems, rock and common excavation, concrete placement, all aspects of powerhouse design, construction and turbine/generator and controls package installation. We also design transmission and interconnection systems and remote operating systems. In short, we provide complete water-to-wire design and construction services for your hydroelectric project. Our creative engineers can help a new hydro facility reach its full potential. This is especially true during the feasibility stage, when the project hinges on maximizing its benefits. We know how essential inter-disciplinary teamwork is, and we bring together our in-house civil, structural, mechanical, electrical, instrumentation and controls, hydraulics and hydrology, geotechnical and geological, cost estimating and analysis, and operations simulation/optimization teams to collaborate. In addition to new greenfield sites, McMillen Jacobs has rehabilitated existing hydro facilities to improve production and safety or to mitigate environmental concerns. Many of these projects are required to meet new relicensing conditions. Our teams have gained much of this experience while performing value engineering or constructability review on hydro facility designs. We design, inspect, and construct dams related to irrigation systems, water resource facilities, hydropower, recreational use, fisheries, and other types of projects. We have experience using many types of materials, including earth, concrete, and rubber inflatable. Our team has designed, constructed, and repaired over 100 diversion structures for fish passage, irrigation, and power production. The structures have been constructed in channels conveying from 20 cfs to 10,000 cfs using materials such as rock, wood, concrete and steel. Each meets fish passage standards while addressing constructability, life cycle O&M costs and in-stream sediment and debris passage. The McMillen Jacobs team of internationally recognized dam safety experts has assisted clients across the country, from new design to operational improvements and decommissioning. Our staff includes civil, structural, geotechnical, hydraulic, and hydrologic engineers with a core group of trained and certified FERC Part12 inspectors. From concrete arch dams to concrete gravity dams, intake structures to bulkheads, turbine supports to flood control structures, we can help your project meet its regulatory requirements. Our team designs and analyzes powerhouses. Our powerhouse rehabilitation includes both turbine runners and complete turbine replacement, turbine rehabilitation, generator rewinds and upgrades, and plant electrical and control upgrades. Structural analysis of existing powerhouses to support these major equipment upgrades, as well as design of new powerhouse structures, is part of our structural design and analysis services. The McMillen Jacobs team has a long track record of working with FERC on hydroelectric projects. Our experience includes initial consultation support during the FERC relicensing process development, preparation and implementation of study plans, coordination on final design products, and construction inspection and reporting during construction. For additional information please see our Energy and Power Market.